What is Pretreatment in Textiles? In textile wet processing sector, pretreatment is a heart of processing of textile. In pretreatment, all these impurities are removed and fabric is brought to a stage where it is more absorbent and white and can be easily processed further. The process which are applied to make the textile materials suitable for printing and dyeing are singeing, de-sizing, scouring, bleaching etc. It is the first process of textile pretreatment processes. Here, fabric has to be collected and inspected to identify fabric defects or fabric faults. Here, fabrics are joined together to facilitate the textile pretreatment processes. To burn out projecting hairy fibers from grey fabric surface, singeing process is performed by passing the grey fabric through a gas flame. Both sides of the fabric are burnt out by the flame. It helps in subsequent chemical processes of the fabric. Fabric brightness and luster of the color and fabric becomes better after printing or dyeing of singed fabric. It is the process of removing starch materials present in the grey fabric. Normally enzyme is used to degrade and remove the starch present in the grey fabric. If those size materials are not removed from the grey fabrics, then the subsequent chemical treatments on the fabric will be irregular, which will cause the defective dyeing and printing. It is the process of removing natural impurities present in the cotton fiber. The natural impurities are pectin’s, pectose, ash, wax, mineral compounds etc. materials. If those impurities present in the cotton fibers are not removed, then it will be difficult to dye or print the fabric uniformly. For performing scouring process of cotton fabric, normally caustic soda and soda ash is used as main reagent. It is the process of removing natural coloring maters present in the fabric. For this purpose, hydrogen peroxide, bleaching powder or other bleaching agents are used. Hydrogen per oxide is the best and most commonly used bleaching agent. If this bleaching treatment is not carried out before printing or dyeing, then the color yield and shade matching may be a great problem. It is a special chemical pre-treatment on the fabric to improve the properties and performance of fabric. In mercerization process, fabric is treated under tension in the 20% caustic soda solution that is termed as mercerization. Due to mercerization many properties of fabric is improved. The important properties which are changed due to application of mercerization process are increase fabric increase strength, increase absorbency power, increase fabric luster, handle property, reduces dye consumption and reduces chemical consumption in textile dyeing process. After completing all the above processes, the treated fabric is washed with hot and cold water. It should be noted here that, sometimes soap solution may also used in this process. 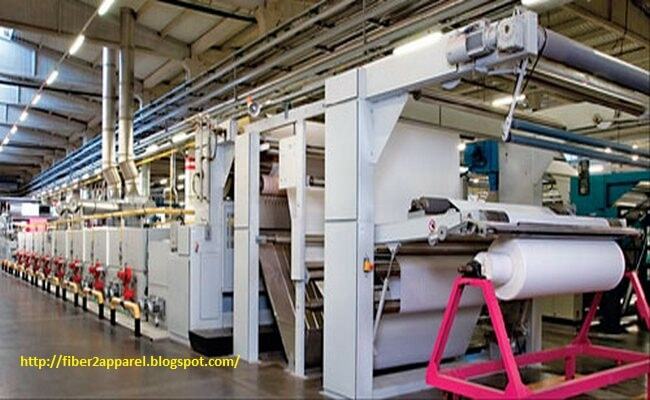 Finally, the treated fabric is dried here by using different types of drying machine.